Showing items in category Canada, sorted by newest listed first. CANADA - 1944 'Prisoners Parcel' cut out piece. 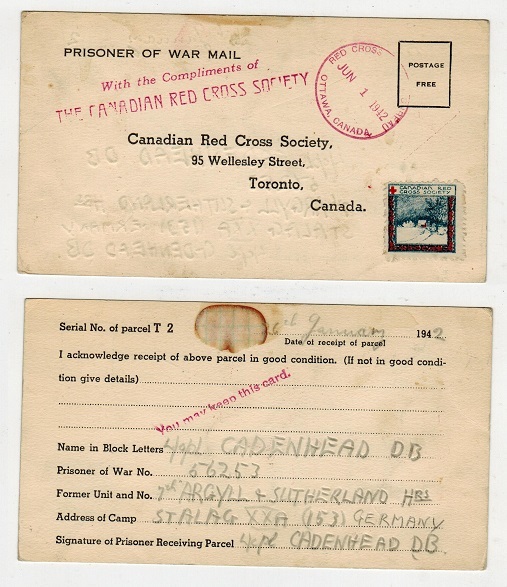 1944 (circa) Red Cross 'PRISONERS PARCEL' cut out with pre-printed from Switzerland and with red THE CANADIAN RED CROSS SOCIETY h/s at left. Scarce . 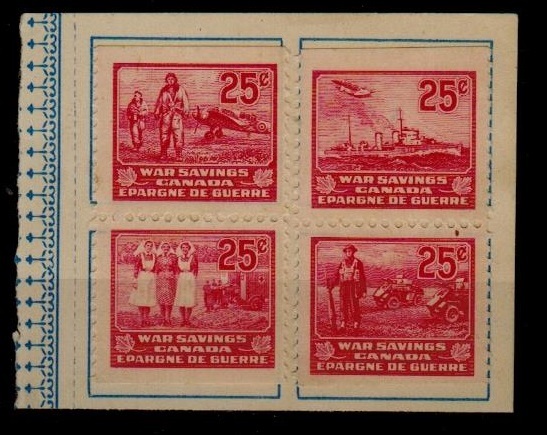 CANADA - 1942 (circa) four 25c red 'WAR SAVINGS' adhesives on original savings book piece. 1942 (circa) 25c red WAR SAVINGS/CANADA ahesives (x4) affixed to piece from original savings book. Unusual. CANADA - 1941 inward censored 'POW' cover from Germany. 1941 (10.2.) 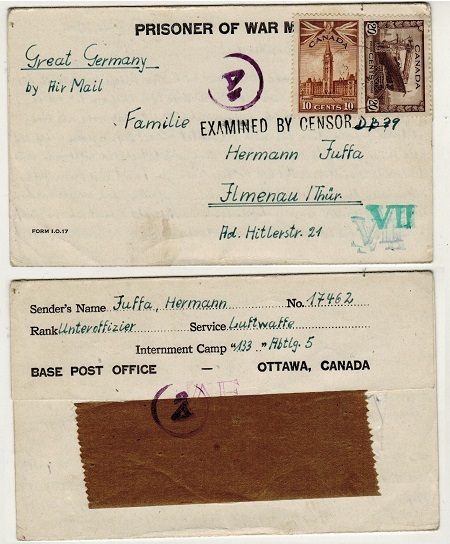 inward stampless cover from a Canadian internee at German concentration camp addressed to Ottawa. Marked 'Internirtenpost' and cancelled by RIBNITZ cds with German swaztica censor label in reverse tied by violet censor h/s with additional EXAMINED BY/CENSOR/ C.85 label added and struck on fronty by scarce red crowned CANADA INT.OP/40/CENSORED h/s. CANADA - 1898 THE FLAG THAT BRAVED patriotic postcard to USA used at ST.ANELREUS. 1898 (DEC.21.) use of red, white and blue 'Patriotic' THE FLAG THAT BRAVED private post card addressed to USA bearing 1c adhesive tied by ST.ANELREUS/QUE cds. A genuine use of this patriotic 'Boer War' card. 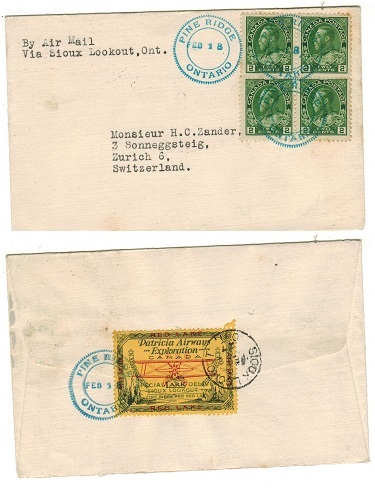 CANADA - 1898 5c rate cover to Switzerland with 'TOO LATE' h/s applied. 1898 (MAR.14.) cover addressed to Switzerland bearing 2c and 3c 'maple leaf' adhesives tied by TORONTO 'flag' cancel with a superb strike of the TOO LATE h/s applied below. 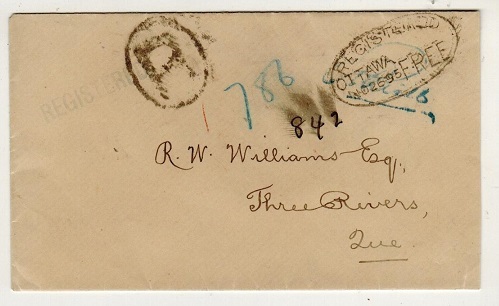 CANADA - 1895 stampless 'REGISTERED/OTTAWA/FREE' local cover. 1895 (NO.26.) stampless registered cover addressed locally cancelled by scarcer oval REGISTERED/OTTAWA/FREE h/s. Greenish REGISTERED straight lioned h/s at left and oval 'R' marking applied over it. THREE RIVERS arrival b/s. 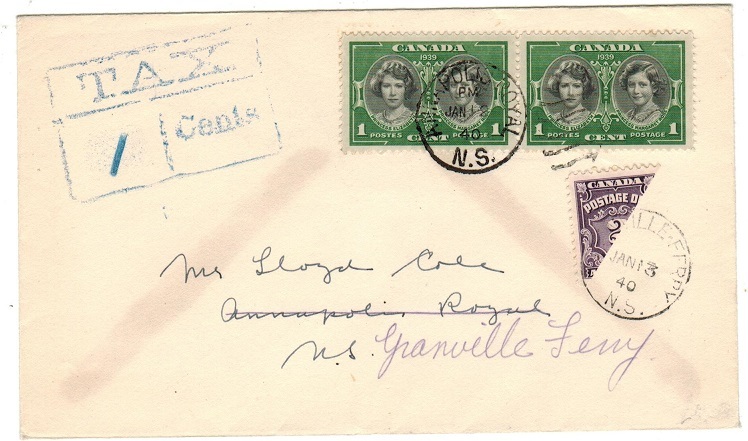 CANADA - 1948 14c rate local cover from HAMILTON with SPECIAL DELIVERY EXPRESS labels applied. 1948 (27.DE.) cover addressed to Ontario bearing 4c adhesive tied in combination with the 10c green 'Special Delivery' adhesive (SG S12) tied by HAMILTON/ONT cds and with two black on red (SD-6-28-8-46) SPECIAL DELIVERY/EXPRES imperforate labels at left. 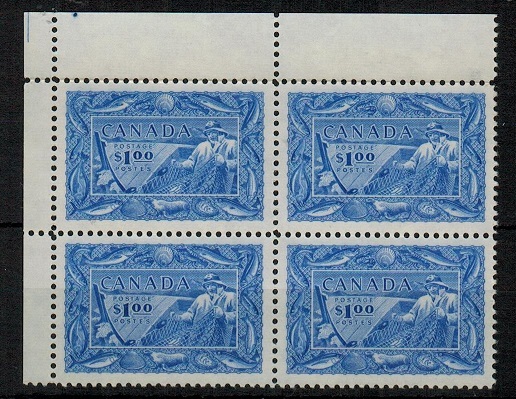 CANADA - 1929 2c blue 'Excise' adhesive used at postage on cover to USA at MELVILLE. 1929 (APR.10.) 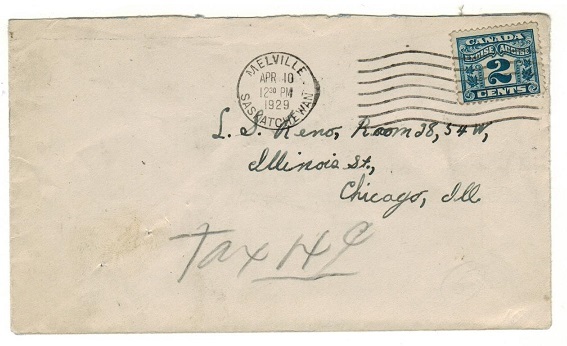 cover addressed to USA bearing 4c blue 'Excise' revenue adhesive tied by MELVILLE/SASKATCHEWAN roller strike. Marked 'Tax 4c' in pencil but un-collected. 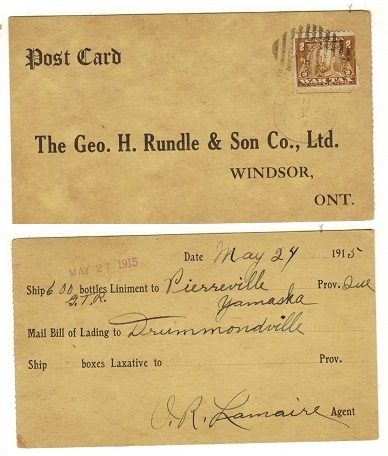 CANADA - 1915 2c 'War Tax' (fault) adhesive used on local postcard from DRUMMONDVILLE. 1915 (MY.25.) pre-printed commercial postcard bearing the 2c olive-brown 'War Tax' adhesive (fault at right side) cancelled by light DRUMMONDVILLE cds. An unusual use of this adhesive as postage. CANADA - 1917 'BUY VICTORY BONDS' and 'HAVE YOU BOUGHT' patriotic labels on 2c rate cover to USA. 1917 (NOV.12.) 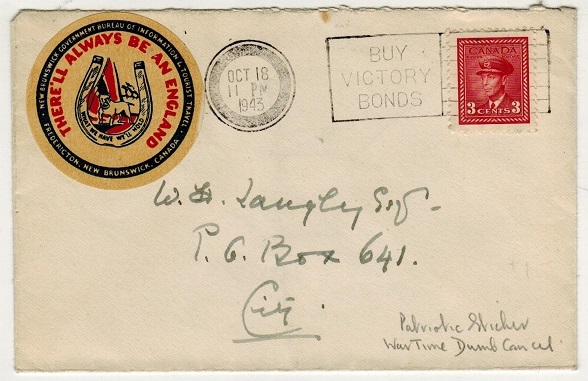 cover addressed to USA bearing 2c '1TC' coil adhesive (die II) tied by WINNIPEG roller strike with a fine example of the BUY VICTORY BONDS war label at left and a further red, white and blue HAVE YOU BOUGHT/YOUR/VICTORY/BONDS label on reverse. CANADA - 1917 'COUNT THAT DAY' patriotic label on 2c rate cover to USA. 1917 (NOV.26.) cover addressed to USA bearing 2c '1TC' coil adhesive (die II) tied by TORONTO roller strike and with red, white and blue COUNT THAT DAY patriotic label on reverse side. 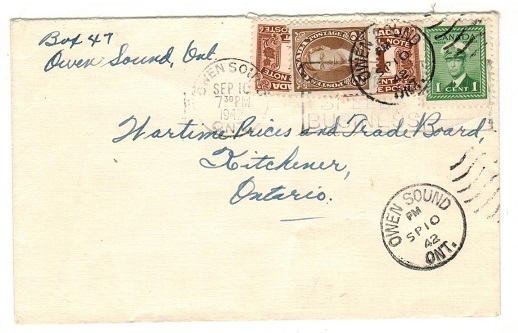 CANADA - 1942 unaccepted 1c 'Postal Note' stamp pair on local cover at OWEN SOUND. 1942 (SP.10.) 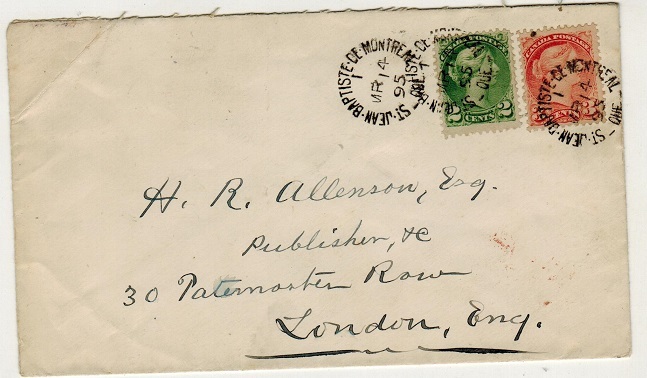 cover addressed locally to Ontario bearing 1c green alongside 1c brown 'Postal Note' adhesives. These were unaccepted and a 2c brown adhesive was applied over and tied OWEN SOUND. CANADA - 1896 2c vermilion PSC unused. H&G 16. 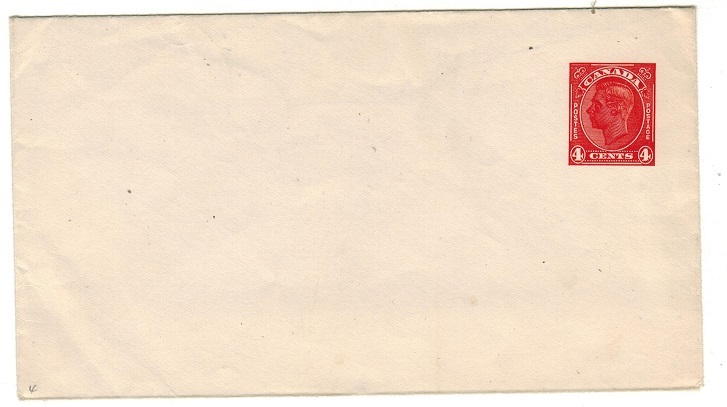 1896 2c vermilion postal stationery postcard in fine unused condition. H&G 16. CANADA - 1943 'THERE ALWAYS BE AN ENGLAND' patriotic label cover used locally. 1943 (OCT.18.) 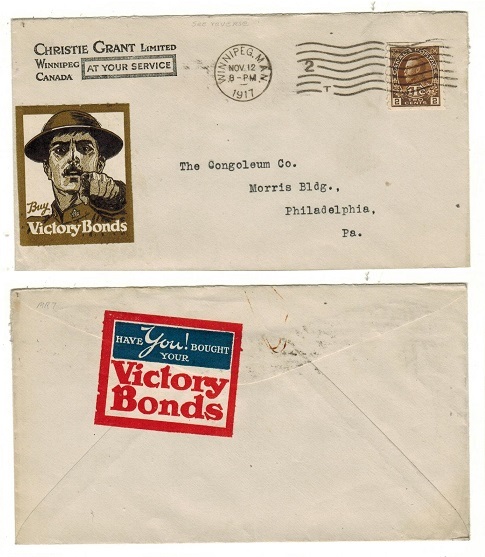 cover addressed locally bearing the 3c adhesive tied by BUY VICTORY BONDS slogan strike with circular SECURITY cancel at left showing the origin town blacked out by ink ring. Bears an interesting circular red and blue on mustard WHAT WE HAVE WE HOLD patriotic label at left issued by the Government Bureau of Information and Tourist Travel in Canada. CANADA - 1943 'V FOR VICTORY' and 'UNION JACK' patriotic label cover used locally. 1943 (MAR.15.) cover addressed locally bearing 2c adhesive tied by VICTORIA-FORT VICTORIA anniversary slogan strike and bearing red, white and blue 'patriotic' 'V FOR VICTORY' and 'UNION JACK/BULLDOG' labels. 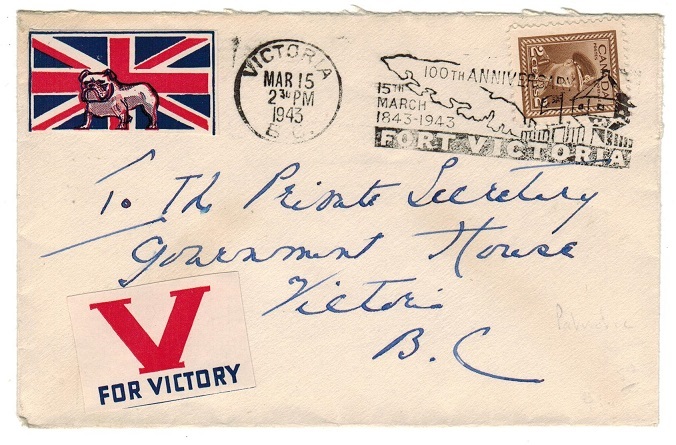 CANADA - 1942 'V FOR VICTORY' patriotic cover used locally. 1942 (OC.15.) 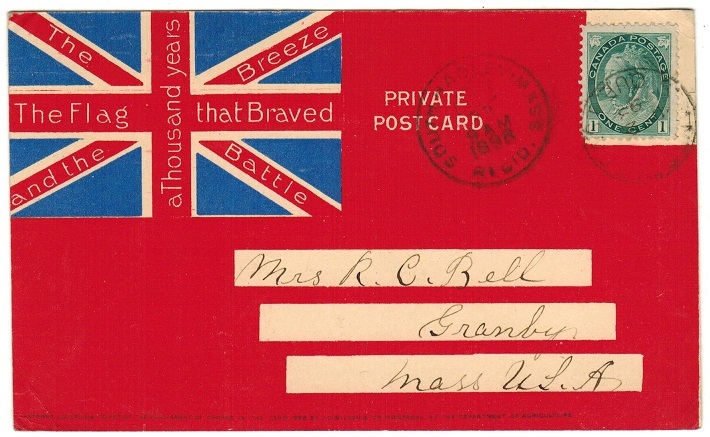 cover addressed locally bearing 16c blue 'special delivery-express' adhesive tied by VICTORIA/BC cds with red, white and blue 'patriotic' 'UNION JACK (BULLDOG)/ V FOR VICTORY label at left. 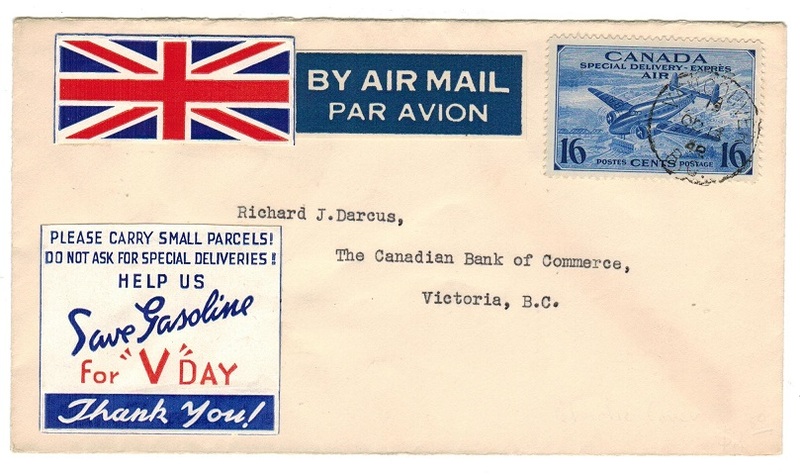 CANADA - 1942 'SAVE GASOLINE' patriotic label cover used locally. 1942 (OC.13.) local cover bearing 16c blue 'special delivery-express' adhesive tied by VICTORIA/BC cds with red, white and blue 'patriotic' 'UNION JACK' and 'PLEASE CARRY SMALL PARCELS/SAVE GASOLINE FOR V DAY' labels. CANADA - 1944 'WITH GODS HELP' patriotic cover to USA. 1944 cover addressed to USA bearing 6c 'air' adhesive tied in combination with magnificent red, blue and gold WITH GODS HELP/WE SHALL NOT FAIL patriotic label by WINNIPEG/HELP THE RED CROSS slogan strike. A truly outstanding label listed by Edwards as I/120. 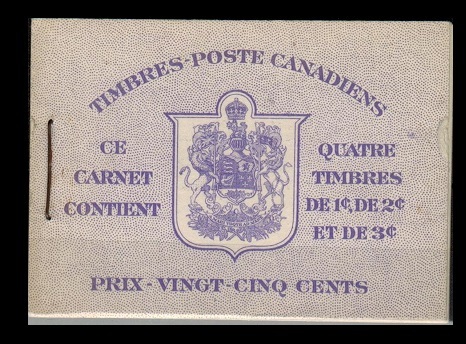 CANADA - 1936 6c taxed 'Postage Due' cover used locally. 1936 (OC.5. 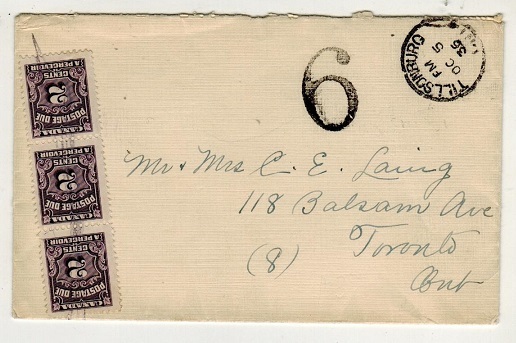 )stampless cover addressed to Toronto cancelled TILLSONBURG with '6' due mark applied in black and with a strip of three of the 2c violet 'Postage Due' added and cancelled by manuscript lines. CANADA - 1944 3c taxed 'Postage Due cover used locally. 1944 (JA.10.) commercial cover addressed to USA bearing a fine strip of three of the 1c brown 'Canada Postal Note' stamps cancelled by LORETTO/ONT cds's. These revenue stamps were not accepted and the cover struck by violet boxed 8/CENTS/DUE handstamp. Interesting item. CANADA - 1943 6c taxed local 'Postage Due' cover. 1943 (MAR.27.) 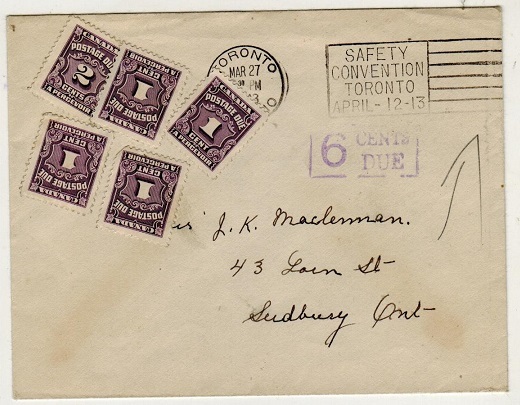 stampless cover addressed locally to Sudbury cancelled by TORONTO/SAFETY/ CONVENTION/TORONTO/APRIL 12-13 advertisement slogan strike. Being under paid the cover is struck by violet boxed '6/CENTS/DUE' h/s with 1c (x4) and 2c violet postage dues added at left. CANADA - 1940 local underpaid tax cover with scarce 2c 'Postage Due' BI-SECTED to pay 1c. 1940 (JAN.12.) 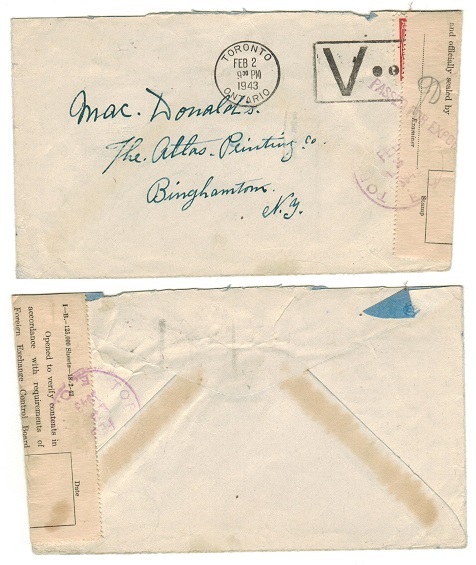 cover addressed LOCALLY IN Nova Scotia but re-directed bearing 1c adhesive pair tied ANNA POLLIS ROYAL. Blue boxed TAX/1/CENT handstamp applied with 2c 'postage due' added but BI-SECTED to make the 1c charge and struck by GRANVILLE FERRY/N.S. cds dated JAN.13.40. Unusual and scarce use of this bi-sected postage due. 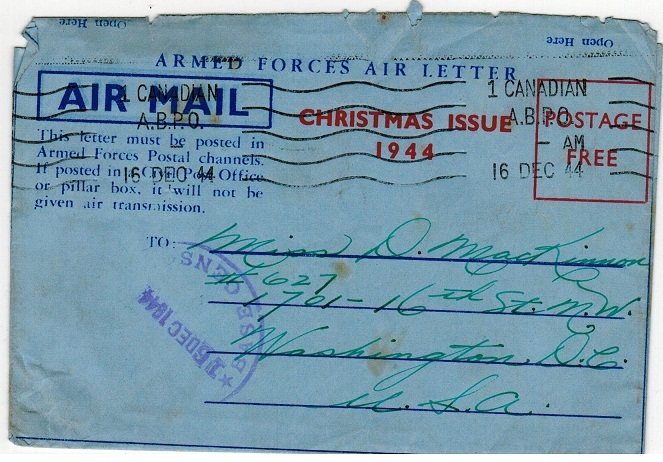 CANADA - 1944 'Postage Free-Christmas 1944' ARMED FORCES AIR LETTER used to USA. 1944 dark blue on blue ARMED FORCES AIR LETTER addressed to USA with red POSTAGE FREE/ CHRISTMAS ISSUE 1944 overprint applied and cancelled by 1 CANADAIAN/A.B.P.O. roller strike dated 16.DEC.44. Kessler type 103 - Format M-C. Very scarce item. CANADA - 1944 censored PRISPONER OF WAR postcard addressed to Germany. 1944 (OC.4.) 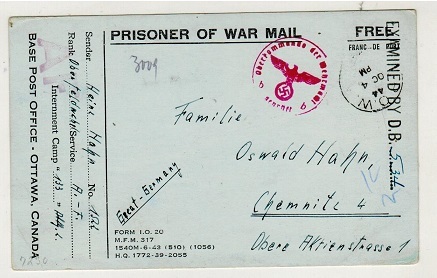 use of pale bluish cream PRISONER OF WAR MAIL-FREE postcard addressed to Germany cancelled by P.O.W. cancel. Written by a German inmate at internment camp 133 in Ottawa. CANADA - 1943 PRISONER OF WAR letter sheet to Germany. 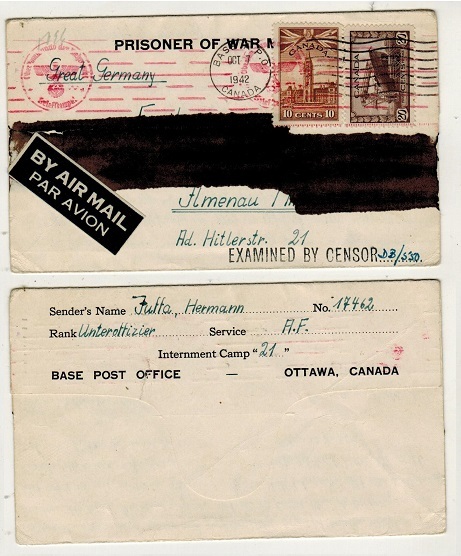 1943 use of PRISONER OF WAR MAIL letter sheet addressed to Germany bearing 10c and 20c adhesives tied by BASE APO/CANADA cds with EXAMINED BY CENSOR…. h/s below with 'DB 79' inserted in manuscript. Violet circular 'Ab' and green 'VII' marks applied on arrival. Written by a German inmate at Internment camp 133 at Ottawa. 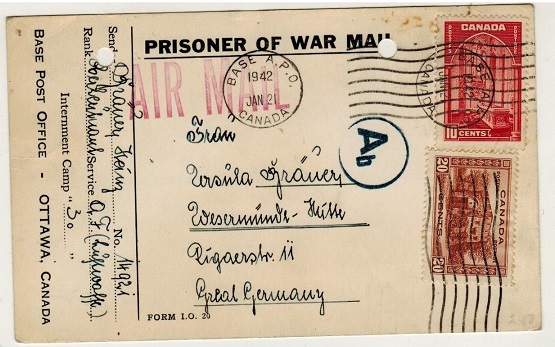 CANADA - 1942 PRISONER OF WAR postcard to Germany with rare CANADA RED CROSS label attached. 1942 (JUN.1) use of pre-printed PRISONER OF WAR postcard cancelled by magenta RED CROSS/OTTAWA CANADA cds with red two lined WITH COMPLIMENTS OF/THE CANADIAN RED CROSS SOCIETY strike and bearing rare red,white and blue perforated CANADIAN RED/ CROSS SOCIETY perforated label at lower left. Scarce item. CANADA - 1942 censored PRISONER OF WAR letter sheet to Germany. 1942 (OCT.7.) 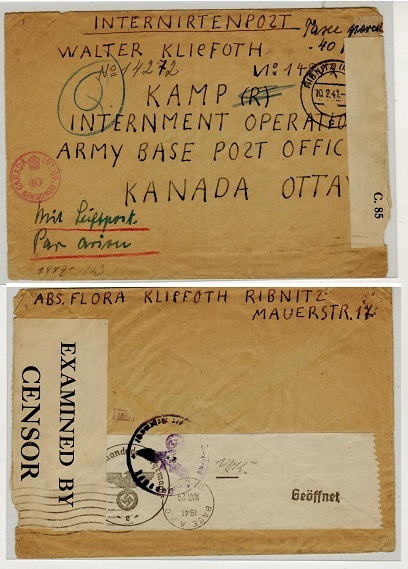 use of PRISONER OF WAR MAIL letter sheet addressed to Germany bearing 10c and 20c adhesives tied by BASE APO/CANADA cds with EXAMINED BY CENSOR…. h/s below with 'DB 550' inserted in manuscript. Part of the message has been officially deleted by the censor and with red 'swastica' arrival roller strike applied on arrival. Written by a German inmate at Camp 21 in Ottawa. 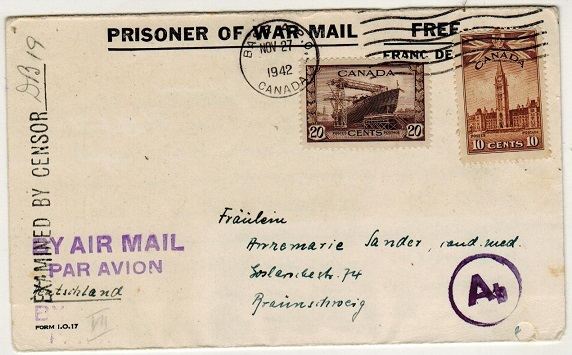 CANADA - 1942 PRISONER OF WAR postcard addressed to Germany. 1942 (JAN.2.) 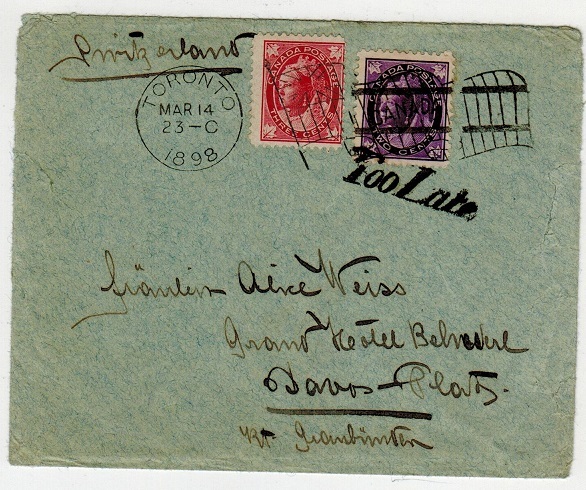 use of PRISONER OF WAR MAIL (Form I.O.20) postcard addressed to Germany (file hole at top) bearing 10c and 20c adhesives tied by BASE A.P.O./CANADA roller strikes and with blue circular 'Ab' censor applied on arrival. A nice Base PO Ottawa card used by internee. 1942 (NOV.27.) 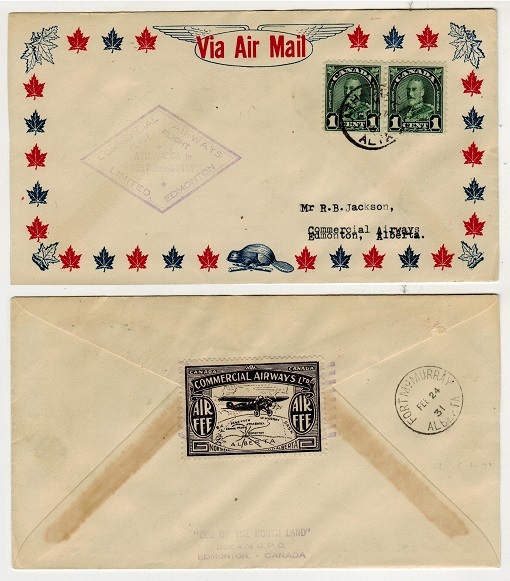 use of PRISONER OF WAR/FREE letter sheet (Form I.O.17) addressed to Germany and bearing 10c and 20c adhesives tied by BASE A.P.O./CANADA cds withviolet two lined BY AIR MAIL/PAR AVION strike at left and struck by black EXAMINED BY CENSOR…. h/s with 'DB 19' initials inserted. Violet circular 'Ab' strike applied on arrival. An unusual 'stamped' use of this 'Free' letter sheet by German internee. 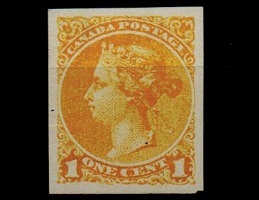 CANADA - 1900 use of 1c blue PSE uprated locally with 1c orange 'Jubilee' adhesive at HALIFAX. 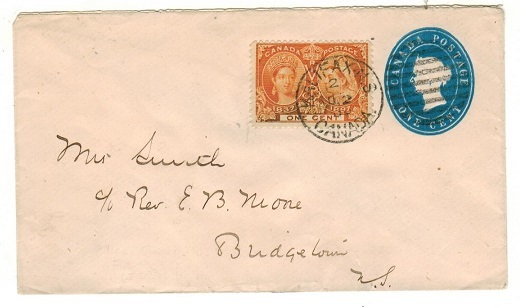 1900 use of QV 1c blue postal stationery envelope addressed locally to Bridgetown in Nova Scotia bearing additional 1c orange 'Diamond Jubilee' adhesive tied HALIFAX and dated AU.2.00. CANADA - 1932 13c bright violet 'Citadel' IMPERFORATE PLATE PROOF adhered to on thick card. 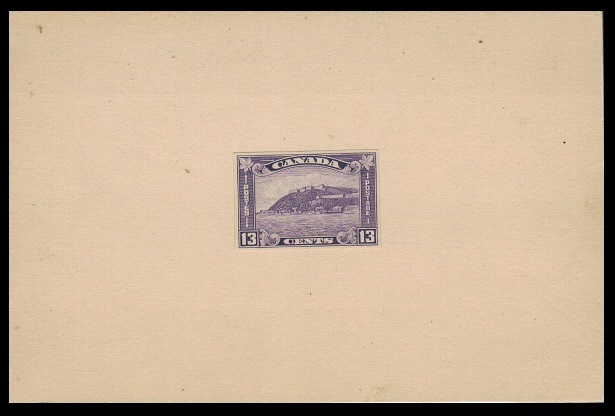 1932 13c 'The Old Citadel-Quebec' (SG Type 68) IMPERFORATE PLATE PROOF in bright violet adhered to large thick card (151x100mm). Marked 'Ex Steinhart' on reverse in pencil. A scarce official proof from the American Bank Note Archive sale. CANADA - 1895 use of 1c black 'Privately Printed' wrapper to USA. 1895 (MY9.) 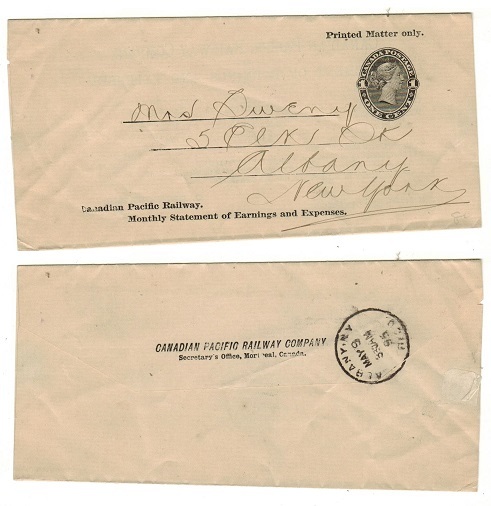 use of 'Privately Printed' 1c black 'Printed Matter Only' postal stationery wrapper used for the 'Canadian Pacific Railway Company' addressed to USA and cancelled on reverse on arrival ALBANY NY. Uncancelled at origin as per usual with these. Scarce item. 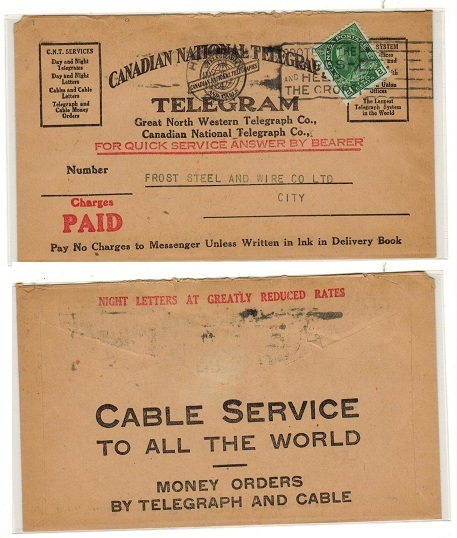 CANADA - 1924 'CANADIAN NATIONAL TELEGRAPH' illustrated telegram envelope used locally. 1924 (MY.26.) use of 'CANADIAN NATIONAL TELEGRAPH-TELEGRAM' envelope addressed locally bearing 2c green tied by HELP THE CROPS slogan strike. 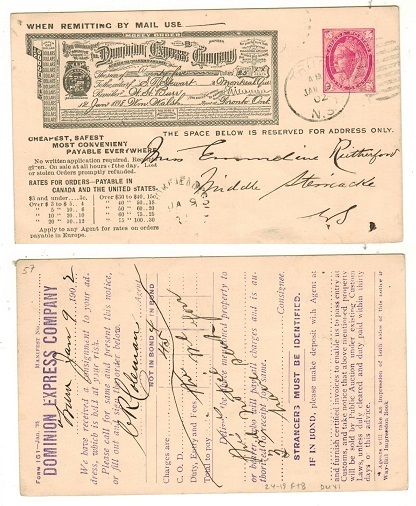 CANADA - 1902 use of 1c pink 'DOMINION EXPREES COMPANY/MONEY ORDER' PSC used at TRURO/N.S. 1902 (JAN.9.) use of 'QV' 1d pink on cream DOMINION EXPRESS COMPANY/MONEY ORDER postcard addressed locally and cancelled by TRURO/N.S. cds. The reverse pre-printed for the Dominion Express Company. A nice private printed use of this stationery. CANADA - 1899 2c on 3c red PSE uprated and registered to Quebec used at TORONOTO. H&G 13. 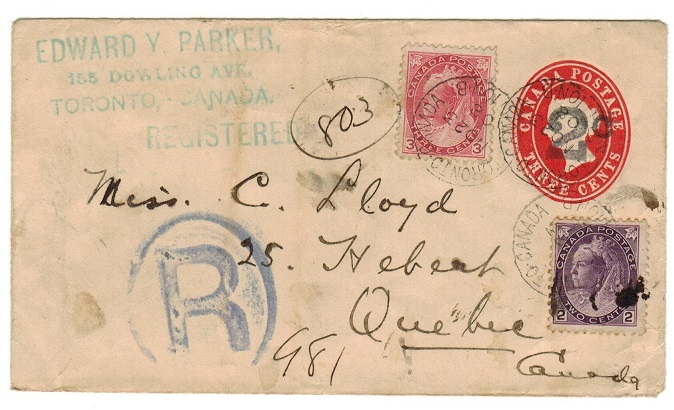 1899 2c black on 3c red on cream provisional postal stationery envelope registered to Quebec bearing additional 2c and 3c 'maple leafs' tied by TORONTO/CANADA cds's dated NO.23.08. H&G 13. CANADA - 1895 5c rate cover to UK used at ST.JEAN BAPTIST DE MONTREAL. 1895 (MR.14.) cover addressed to UK bearing 2c and 3c 'small head' adhesives (SG type 21) tied by neat ST.JEAN BAPTIST DE MONTREAL/ONT cds's with code '1' slug. LONDON arrival b/s. 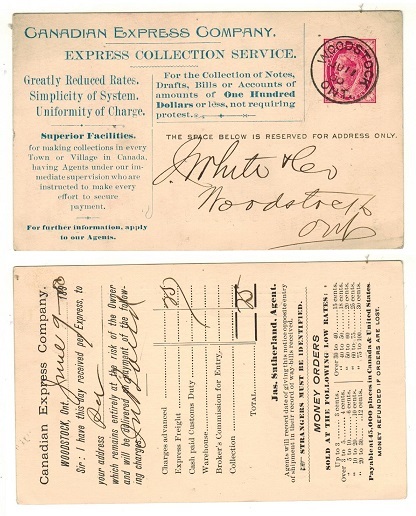 CANADA - 1897 1c rose 'EXPRESS COLLECTION SERVICE' PSC used locally cancelled WOODSTOCK/ONT. 1897 1c rose-carmine on cream postal stationery postcard pre-printed for use by 'Canadian Express Company' and headed on front EXPRESS COLLECTION SERVICE. Cancelled by superb WOODSTOCK/ ONT. cds dated JU.11.00 and with reverse for use by the Woodstock office and with 'Money Orders' rates at bottom. A scarce privately printed card. 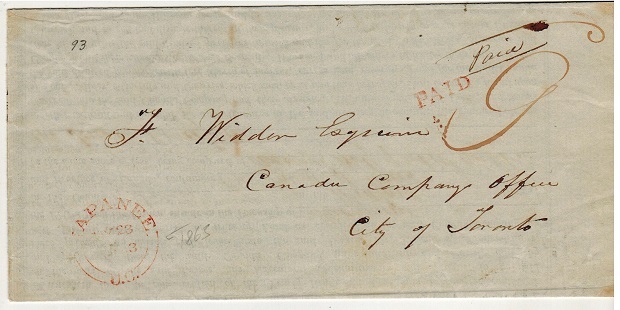 CANADA - 1867 stampless 'FREE' cover used internally struck OTTAWA & PRESCOTT RAILWAY. 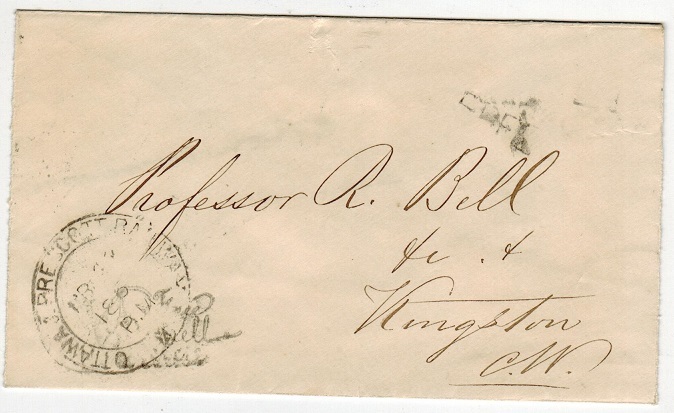 1867 unstamped cover addressed to Kingston Monteal struck by part FREE handstamp in black with scarce OTTAWA & PRESCOTT RAILWAY cds below (Boggs Type 8d). KINGSTON arrival b/s dated MR.23.67. 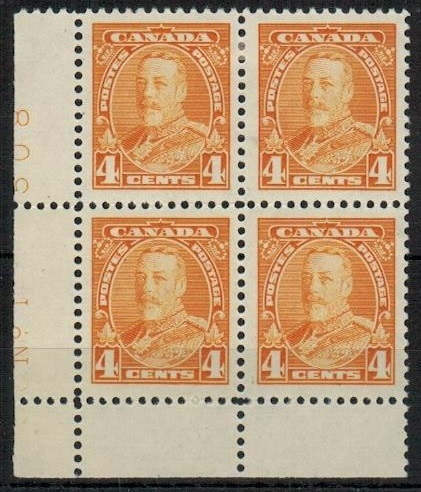 CANADA - 1935 3c scarlet fine mint plate No.4/652 block of four. SG 343. 1935 3c scarlet in a fine mint plate No.4/652 bottom corner marginal block of four. SG 343. 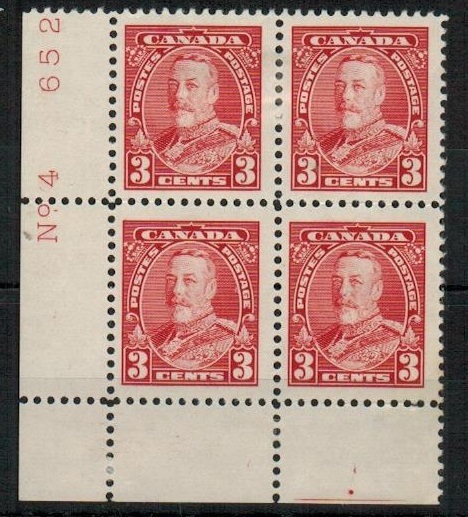 CANADA - 1935 3c scarlet fine mint plate No.8/859 block of four. SG 343. 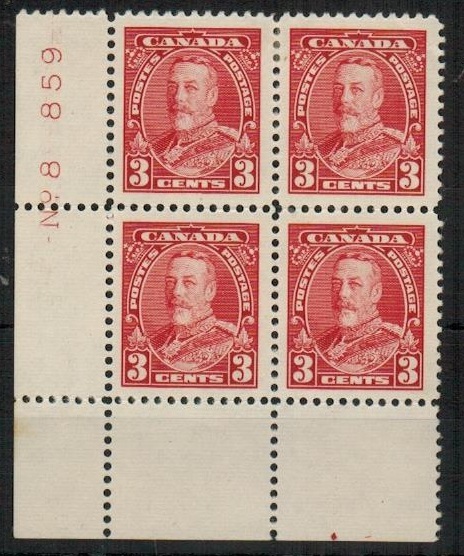 1935 3c scarlet in a fine mint plate No.8/859 bottom corner marginal block of four. SG 343. CANADA - 1935 4c yellow fine mint plate No.1/508 block of four. SG 344. 1935 4c yellow in a fine mint plate No.1/508 bottom corner marginal block of four. SG 344. CANADA - 1899 6c rate cover to USA used at MONTREAL. 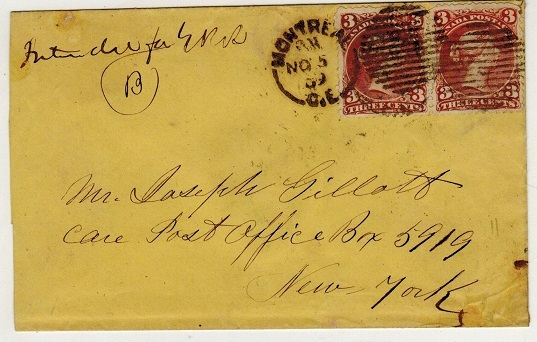 1899 (NO.5) cover to New York bearing a fine pair of the 'large head' 3c brown-red adhesives (SG 58) tied by grilled duplex's with MONTREAL cds alongside. 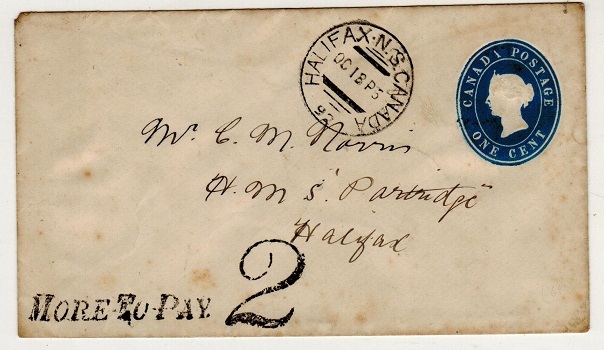 CANADA - 1877 1c blue PSE used locally at HALIFAX with 'MORE TO PAY' h/s. H&G 3. 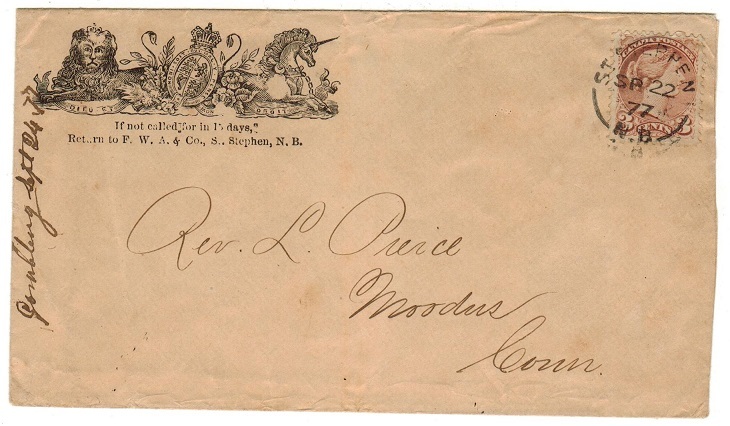 1877 1c blue on cream postal stationery envelope (size a) addressed to Halifax and cancelled by HALIFAX N.S.CANADA cds dated OC.18.92 and struck at lower left by scarce black MORE TO PAY handstamp with fancy '2' struck alongside. H&G 3. CANADA - 1877 3c cover to USA used at ST.STEPHEN/N.B. 1877 (SP.22.) 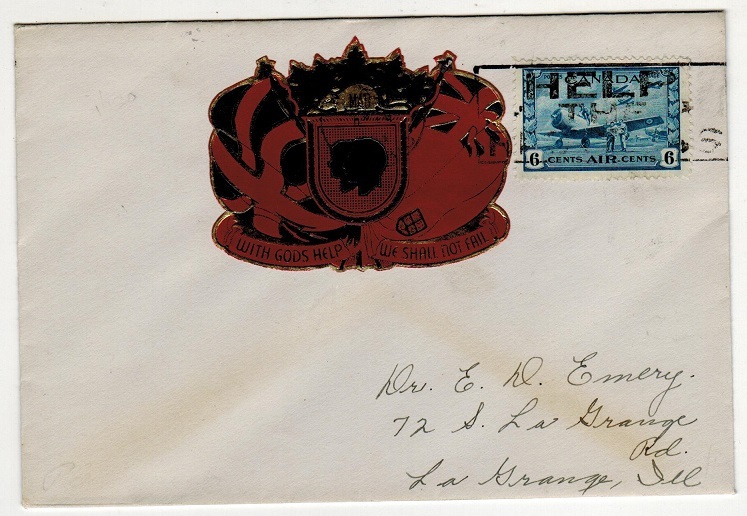 cover addressed to USA with attractive coat of arms pre-printed at top left and bearing 3c 'small head' adhesive tied ST.TEPHEN/N.B. CANADA - 1903 1c rose 'Standard Manufacturing Co' privately printed PSC used at PUBMIAICO HEAD. 1903 1c rose on cream 'Privately Printed' postal stationery postcard addressed to New Bruswick cancelled by PUBMIAICO HEAD/ N.S. 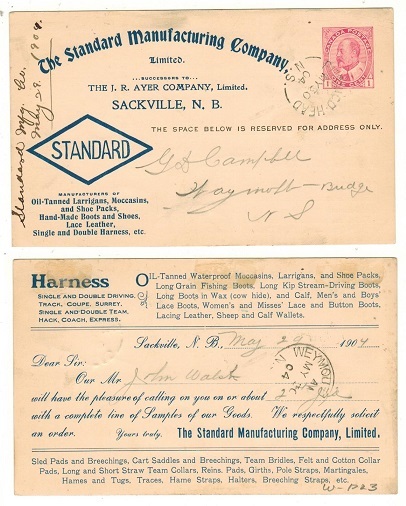 cds dated MY.30.04 with 'The Standard Manufacturing Company' advertisement on front used for acknowledgement of a representative to call concerning samples of all horse, harness and tack equipment. 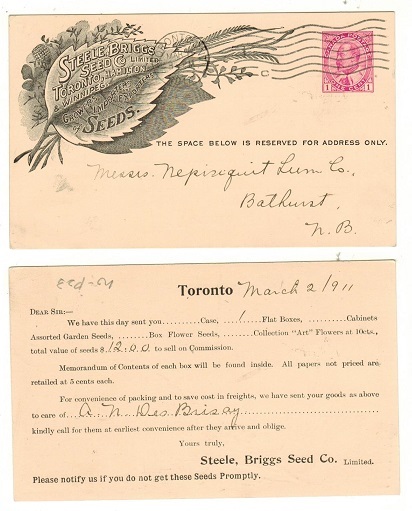 CANADA - 1903 1c rose 'Steele Briggs Seed Co' privately printed PSC used at TORONTO. 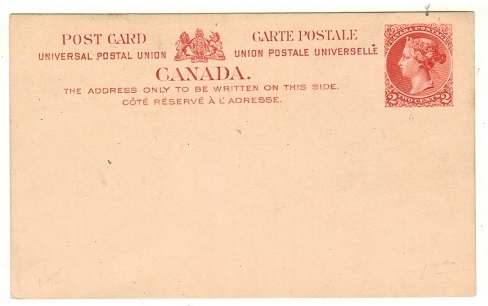 1903 1c rose on cream 'Privately Printed' postal stationery postcard addressed to Bathurst NB and cancelled by TORONTO roller strike dated MAR.6.1911. The front pre-printed with illustrated 'Steele, Briggs Seed Co. Ltd of Toronto' advertisement. CANADA - 1898 1c rose 'Rose Point' illustrated PSC used at MONTREAL. H&G 4. 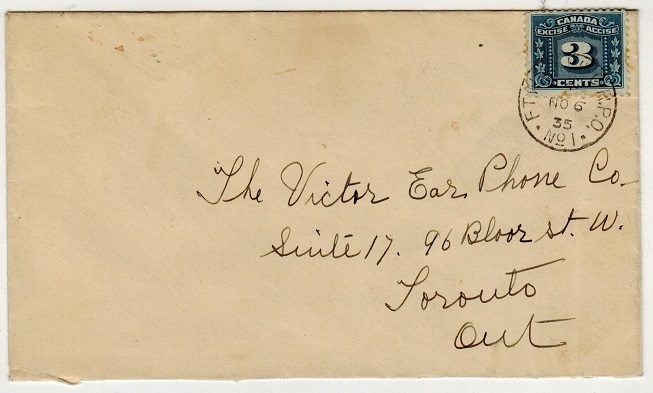 1898 1c rose on cream postal stationery postcard addressed to Ontario depicting a green illustration of 'From Rose Point, Parry Sound' at left side and cancelled by MONTREAL 'flag' strike dated APR.17.1899. 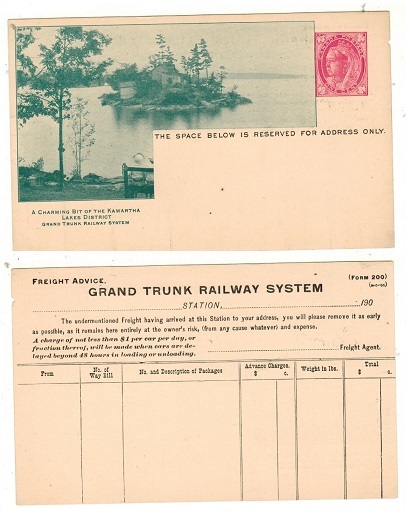 The reverse pre-printed for use by the Grand Turk Railway. H&G 4. CANADA - 1898 1c rose 'Kawartha Lakes' illustrated PSC unused. H&G 1. 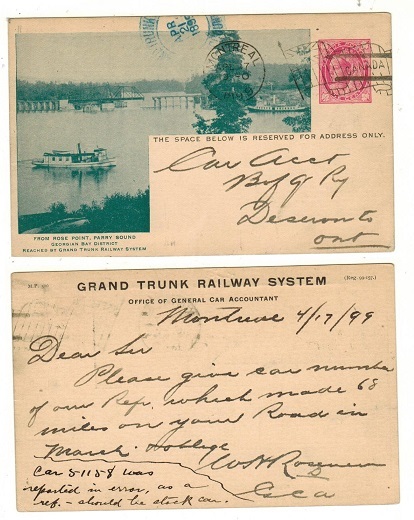 1898 1c rose on cream postal stationery postcard in unused condition depicting a green illustration of 'A charming bit of The Kawartha lakes' at left side with the revese pre-printed for use by the Grand Turk Railweay. H&G 1. CANADA - 1899 Two FOURNIER '2 Cents' handstamps on cream card. 1899 two differing strikes of the FOURNIER '2 Cents' handstamp printed in black on cream card taken from the Fournier forgery handbook. 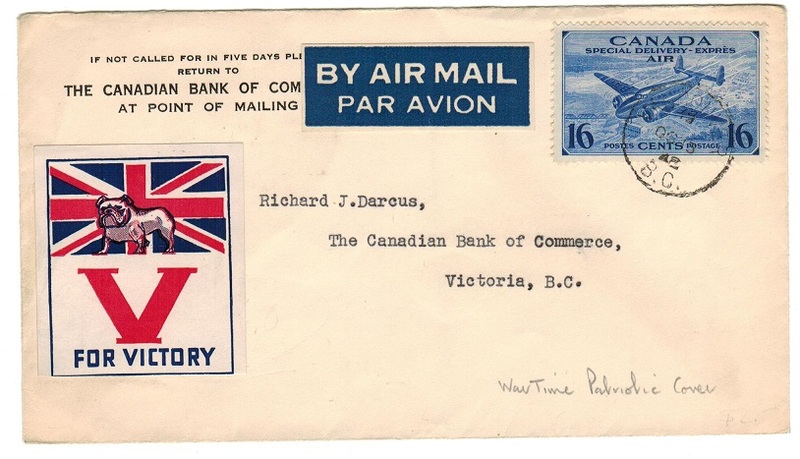 CANADA - 1927 first flight cover via 'Patricia Airways' with label. 1927 first flight cover to Switzerland sent from Pine Ridge via Sioux Lookout by Patricia Airways. Bears 2c green block of four cancelled by special cog wheeled PINE RIDGE/ONTARIO cancels in blue and bearing the scarcer PATRICIA AIRWAYS EXPLORATION label on reverse side similarly cancelled and with SIOUX LOOKOUT arrival. 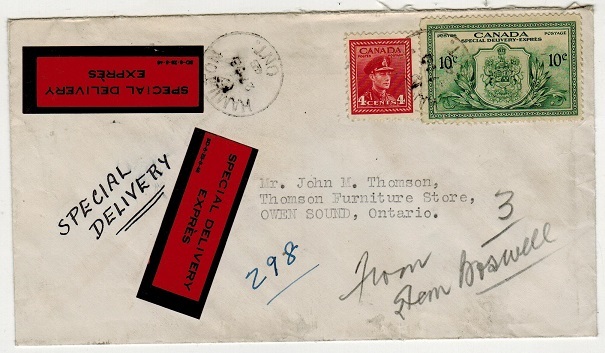 CANADA - 1935 local cover bearing 3c EXCISE tax stamp used at FTW/RPO/No.1 railway strike. 1935 (NO.6.) cover addressed to Totronto bearing the 3c blue EXCISE tax stamp cancelled by FTW/RPO/No.1 railway cancel of Fort William. Unusual use of this tax stamp for postage. CANADA - 1943 4c red PSE unused. H&G 63. 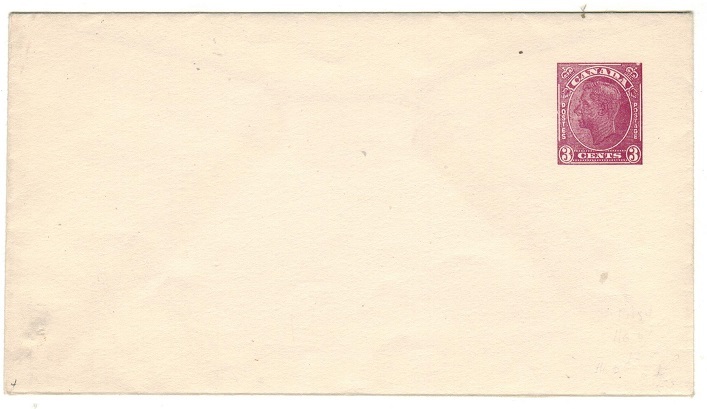 1943-44 4c Red on white postal stationery envelope. Fine unused. H&G 63. 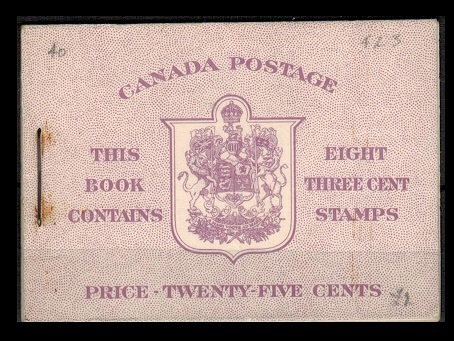 CANADA - 1943 3c purple PSE unused. H&G 62. 1943-44 3c Purple on white postal stationery envelope. Fine unused. H&G 62. CANADA - 1938 3c red PSE unused. H&G 59. 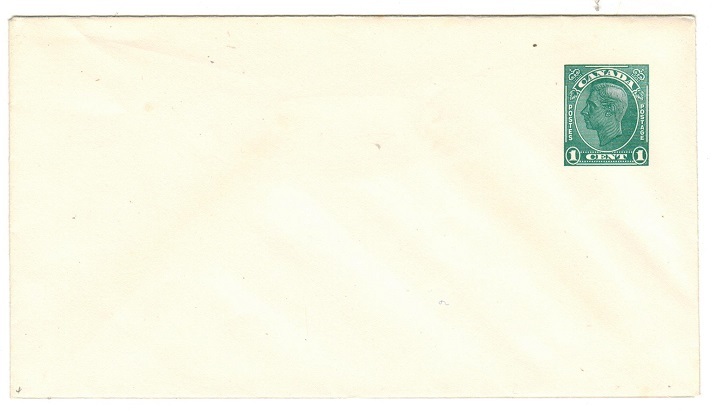 1938 3c Red on white postal stationery envelope. Fine unused. H&G 59. 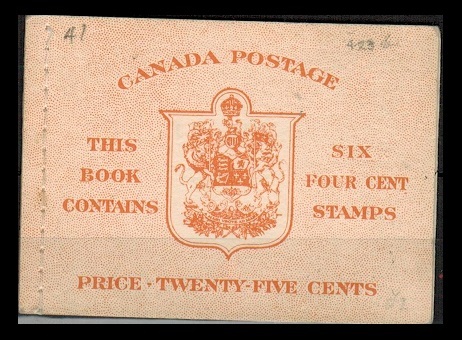 CANADA - 1938 2c brown PSE unused. H&G 58. 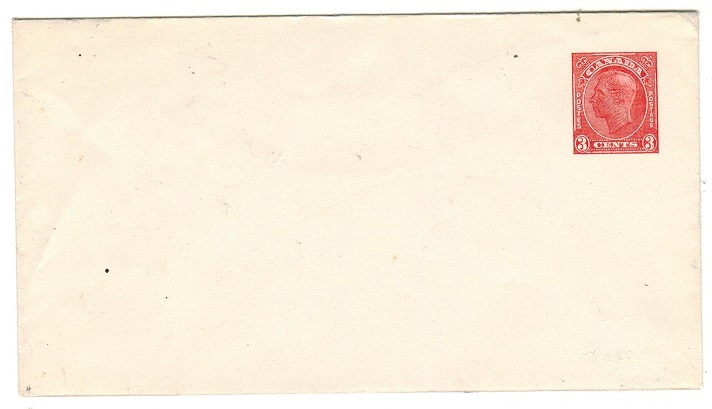 1938 2c Brown on white postal stationery envlope. Fine unused. H&G 58. CANADA - 1938 1c blue-green PSE unused. H&G 57. 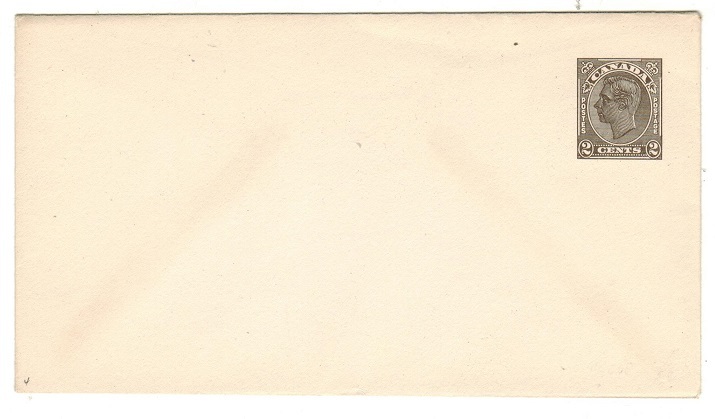 1938 1c Blue green on white postal stationery envelope. Fine unused. H&G 57. CANADA - 1863 local use of Indenture cancelled NAPANEE/U.C. in red. 1863 (JY.23.) use of folded 'Indenture' addressed to Toronoto. Marked 'Paid' and rated '9d' with additional red PAID handstamp applied and struck by red double arc NAPANEE/U.C. handstamp. CANADA - 1930 'Electricity and Gas Inspection' revenue series of 11 mint. Barefoot and Hall 1-11. 1930 "Electricity and Gas Inspection" revenue series of 11 with the 50c-$10 printed in orange and the 60c-$10 in blue all with blue control numbers. Fine fresh mint condition. Barefoot and Hall 1-11. CANADA - 1930 'Weights and Measures' revenue series of 12 mint. Barefoot and Hall 30-41. 1930 'Weights and Measures' revenue series of 12 printed in black with blue controls all in fine fresh mint condition. Barefoot and Hall 30-41. 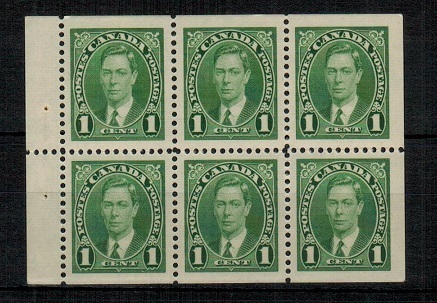 CANADA - 1937 1c green BOOKLET PANE of six in unmounted mint condition. SG 357b. 1937 1c green BOOKLET PANE of six in unmounted mint condition. SG 357b. CANADA - 1971 6d 'Discovery' unmounted mint pair with DRAMATIC COLOUR SHIFT. SG 675. 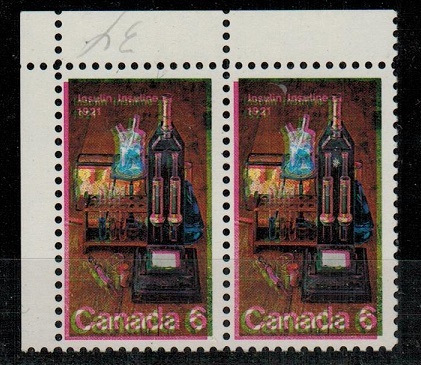 1971 6d 'Discovery of Insulin' unmounted mint top corner maginal pair with dramatic COLOUR SHIFT giving the impression of a double print. Very unusual. SG 675. 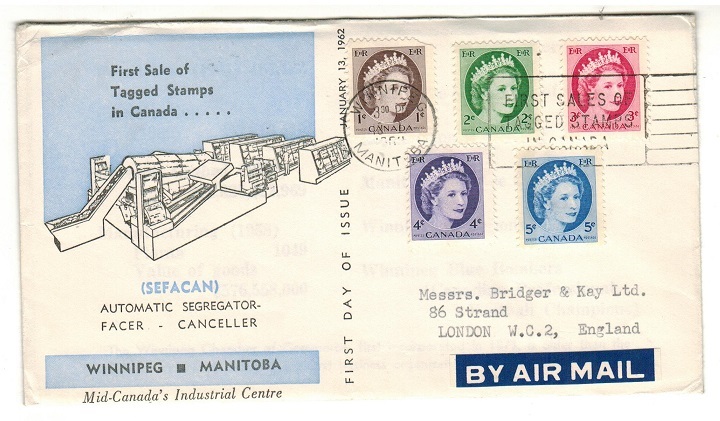 CANADA - 1962 '1st Tagged Stamps' FDC to UK used at WINNIPEG. 1962 'First Tagged Stamps Of Canada' illustrated first day cover addressed to UK bearing the 1c-5c phoshor band series (SG 463-467p) tied by WINNIPEG/TAGGED STAMP slogan strike. Scarce. 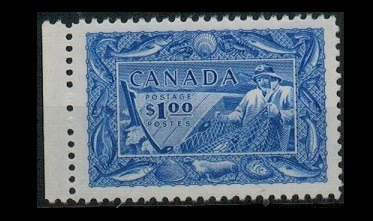 CANADA - 1951 $1 'Fisherman' unmounted mint block of four. SG 433. 1951 $1 ultramarine 'Fisherman' adhesive in a fine unmounted mint corner marginal block of four. SG 433. CANADA - 1950 25c orange BOOKLET of six of the 4c with English text stiched at left. SG SB45a. 1950 25c orange BOOKLET containing a pane of six of the 4c adhesives (SG 417a) with English text stiched at left. SG SB45a. CANADA - 1950 25c purple BOOKLET with English text and stapled at left. SG SB44. 1950 25c purple BOOKLET containing a two panes of four of the 3c adhesives (SG 416a) with English text and stapled at left. Light cover bend. SG SB44. CANADA - 1946 25c black on white BOOKLET with bilingual text. SG SB42c. 1946 25c black on white BOOKLET with bilingual text. SG SB42c. CANADA - 1943-46 25c black on white BOOKLET with English text. SG SB42. 1943-46 25c black on white BOOKLET with English text. SG SB42. CANADA - 1942 25c purple BOOKLET and 3c panes of with French text. SG SB37a. 1942 25c purple BOOKLET containing 1c, 2c and 3c panes of four with French text. SG SB37a. 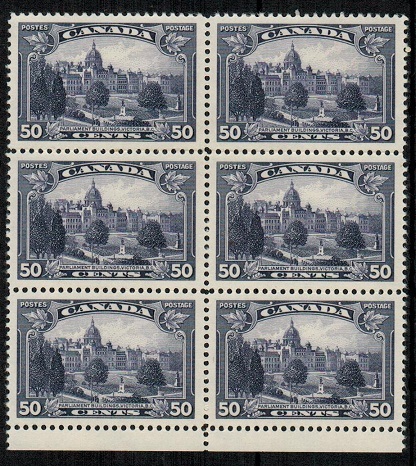 CANADA - 1970+ duplicated BOOKLET range sold at face value. 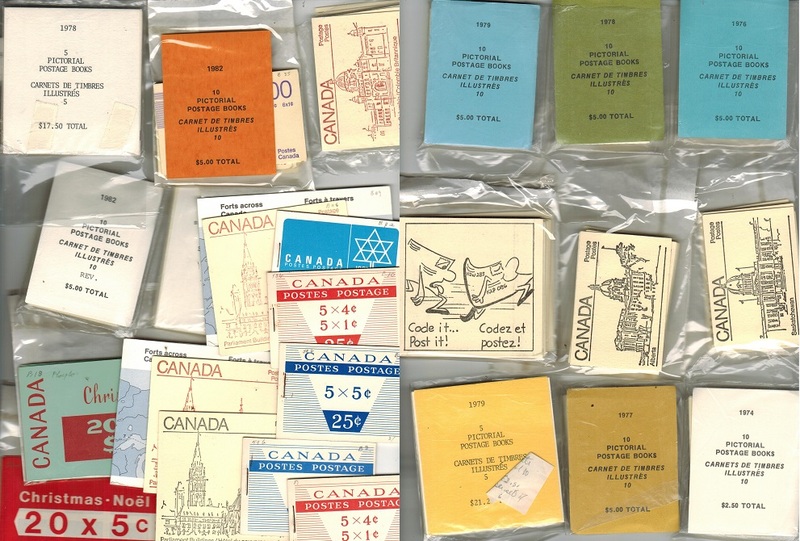 1970-1980 (circa) duplicated range of Canadian booklets. The total face value being CA$169.00. Sold at basically face value. 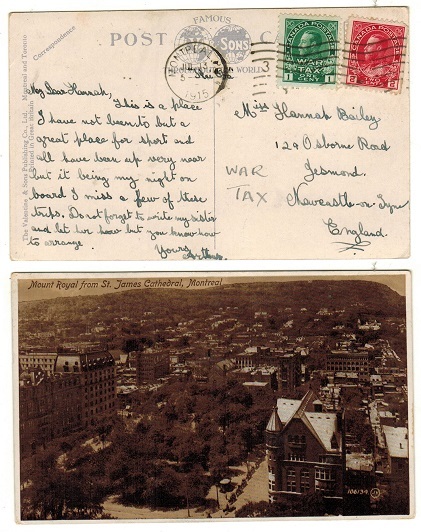 CANADA - 1915 2c + 1c 'War Tax' stamps on picture postcard to UK used at MONTREAL. 1915 (JU.13.) picture postcard addressed to UK bearing 2c adhesive tied with 1c 'War Tax' adhesive by MONTREAL roller strike. 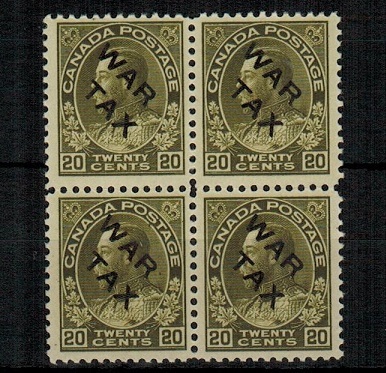 CANADA - 1915 20c olive green 'War Tax' fine mint block of four. SG 226. 1915 20c olive green in a very fine lightly mounted mint block of four overprinted WAR TAX. SG 226. CANADA - 1891 2c bright green IMPERFORATE PLATE PROOF. 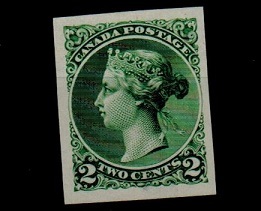 1891 2c bright green IMPERFORATE PLATE PROOF (head to left) submitted by the Canadian Bank Note Company of Montreal printed on thin white paper. CANADA - 1891 1c bright yellow IMPERFORATE PLATE PROOF. 1891 1c bright yellow IMPERFORATE PLATE PROOF (head to left) submitted by the Canadian Bank Note Company of Montreal printed on thick white card. CANADA - 1887 3c red PSE unused overprinted SERVICE. 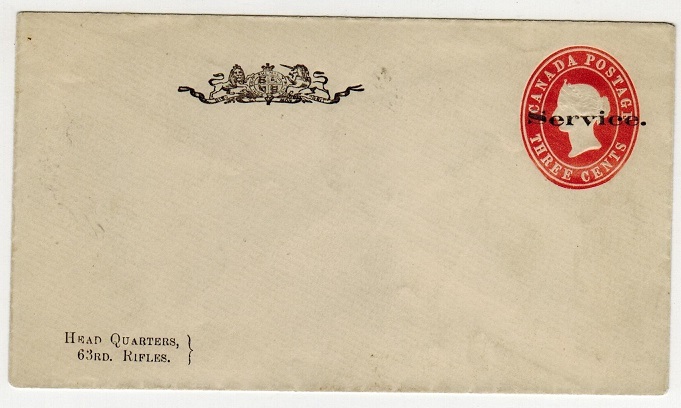 1887 3c red on cream postal stationery envelope (H&G fig 61) in fine unused condition but ovpt'd by 'black' SERVICE h/s with black crest under heading & HEAD QUARTERS/63rd RIFLES at bottom left corner. Produced by Henry Heckler of Halifax who was the Captain of the 63rd rifles sent to the North West Provinces during the Louis Riel rebellion. Stationery produced by him were not officially sanctioned but were used and accepted. CANADA - 1877 1c blue PSE unused overpinted OFFICIAL. 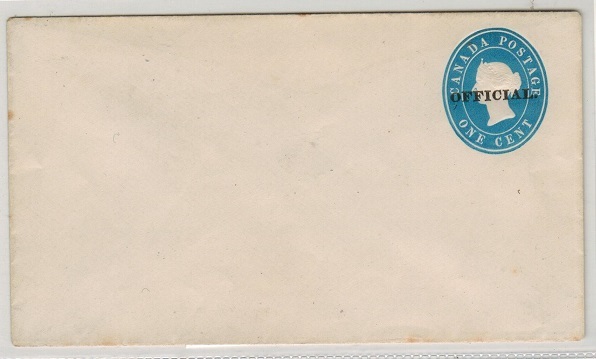 1877 1c blue on cream postal stationery envelope (H&G 3) in unused condition struck by OFFICIAL handstamp in black. Produced by Captain Heckler of the 63rd rifles and is bogus. 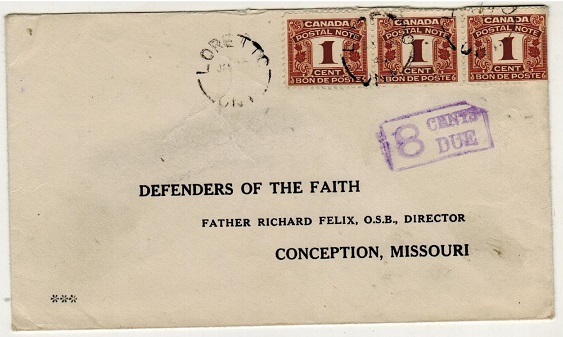 The majority of the envelopes he produced were those of the SERVICE overprints as opposed to this OFFICIAL strike. CANADA - 1954 25c blue BOOKLET's. SG SB53 + 53a. 1954 25c blue BOOKLET containing a pane of five 5c 'QEII head' adhesives. One stiched at left the other stapled at left. SG SB53 + 53a. CANADA - 1954 25c blue BOOKLET's. SG SB52 + 52a. 1954 25c blue BOOKLET containing a pane of five 5c 'beaver' adhesives. One stiched at left the other stapled at left. SG SB52 + 52a. CANADA - 1953 25c purple BOOKLET's. SG SB50 + 50a. 1953 25c purple BOOKLET containing two panes of four of the 3c adhesive. One with English text the other bilingual. SG SB50 + 50a. CANADA - 1954 25c orange BOOKLET's. SG SB49 + 49a. 1954 25c orange BOOKLET containing a pane of six of the 4c adhesives. One in English text the other bilingual. SG SB49 + 49a. CANADA - 1951 $1 ultramarine U/M. SG 433. 1951 $1 ultramarine 'Fisherman' adhesive in fine unmounted condition. Well centered. SG 433. 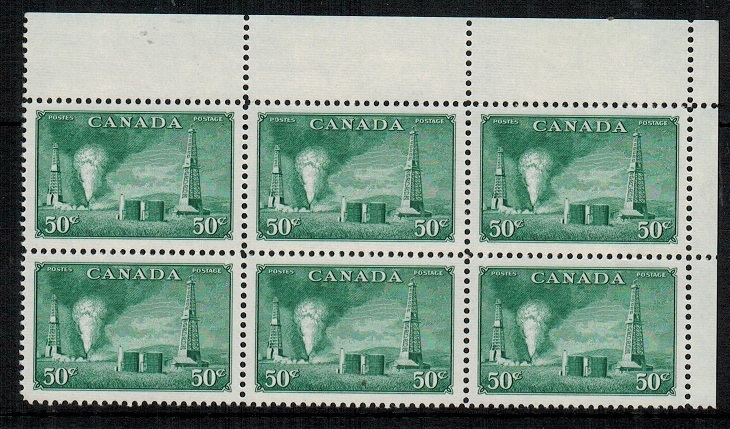 CANADA - 1950 50c green U/M block of six. SG 431. 1950 50c green 'Oil Rig' adhesive in a fine unmounted mint corner marginal block of six. Nicely centered. SG 431. CANADA - 1935 50c deep violet U/M block of six. SG 350. 1935 50c deep violet 'Parliamentary Building' adhesive in a fine unmounted mint bottom marginal block of six. Nicely centered. SG 350. 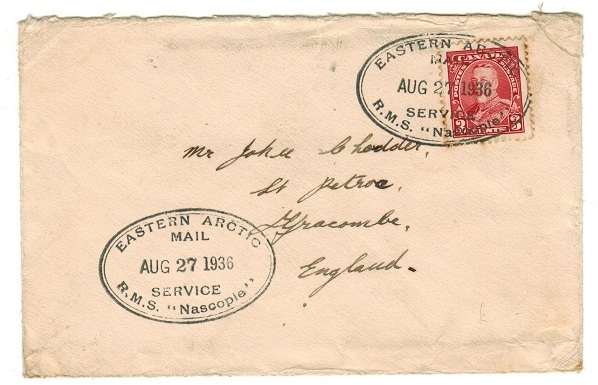 CANADA - 1936 'EASTERN ARCTIC MAIL SERVICE/RMS NASCOPIE' cover to UK. 1936 (AUG.27.) 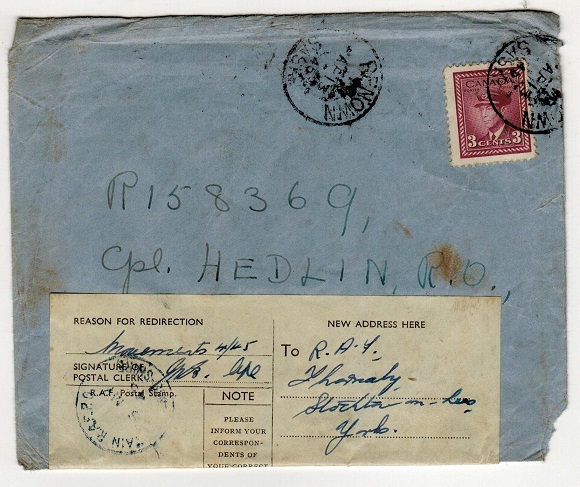 cover addressed to UK bearing 3c adhesive tied by oval EASTERN ARCTIC MAIL SERVICE/R.M.S.NASCOPIE h/s with additional strike at lower left. 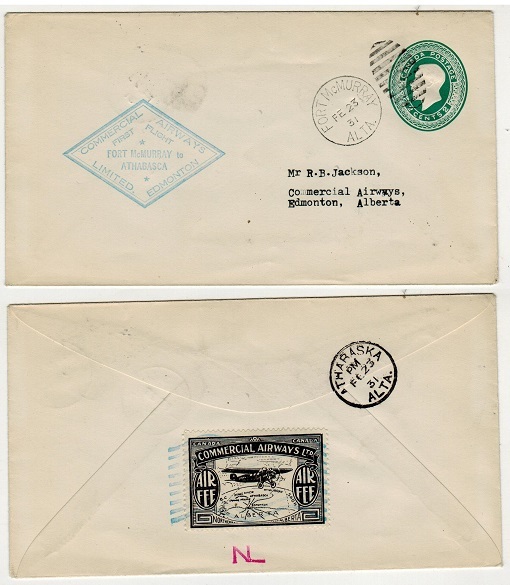 CANADA - 1932 first flight cover to Edmonton from Peace River bearing scarce 1c 'coil' pair. 1931 (FE.12.) 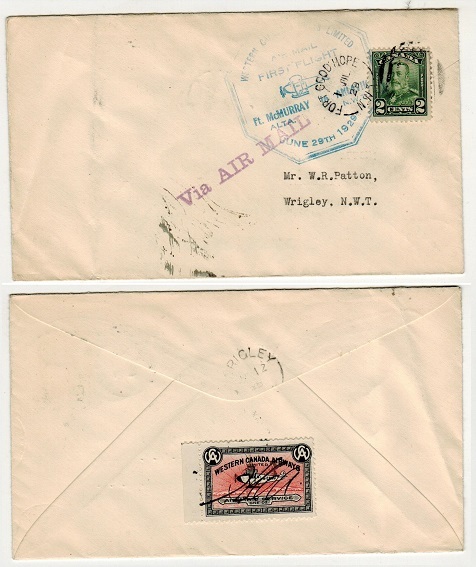 first flight cover addressed to Walkrville bearing a fine 1c orange adhesive pair from the scarcer 'coil' issue with perf 8 x IMPERF (SG 286) tied by PEACE RIVER cds with green FIRST FLIGHT/PEACE RIVER TO/EDMONTON cachet at left and with black COMMERCIAL AIRWAYS LIMITED label on reverse side tied by violet boxed USE AIR MAIL rubber h/s. Only 531 covers flown by pilot W.R.May. 1931 (FE.24.) 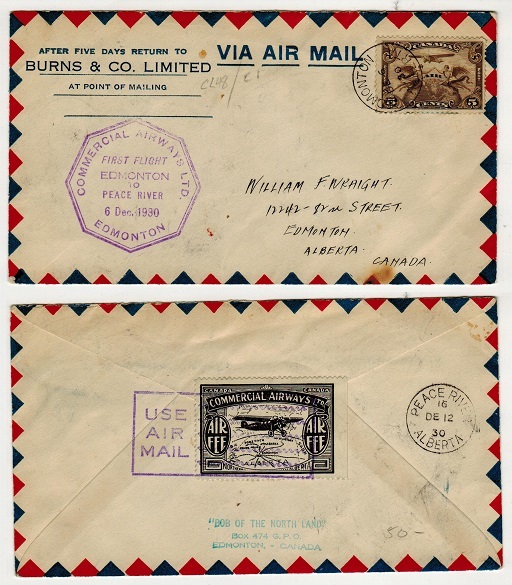 first flight use of 2c orange postal stationery envelope addressed to Athabasca cancelled EDMONTON and with violet octagonal FIRST FLIGHT/EDMONTON/TO/ATHABASCA cachet at left and with black COMMERCIAL AIRWAYS LIMITED label on reverse flap tied by violet rubber USE AIR MAIL h/s. CANADA - 1931 first flight cover to Edmonton from ATHABASKA with 'CAL' label on reverse. 1931 (FE.24.) first flight covrer addressed to Edmonton (h/s on reverse) bearing a pair of the 1c green adhesive tied by ATHABASKA/ALTA cds with violet FIRST FLIGHT/ATHABASCA TO/FORT McMURRAY cachet on front and with black COMMERCIAL AIRWAYS LIMITED label on reverse tied by USE AIR MAIL rubber boxed h/s. 1,044 covers flown. CANADA - 1951 stampless local outer wrapper used at BARRIE with 'PAID/6d' h/s applied in red. 1851 (JU.12.) use of stampless outer warpper addressed to Toronto and cancelled by BARRIE/B.C. cancel with 'Paid' inserted in manuscript and struck by red circular PAID/6d handstamp. RL type HS212. CANADA - 1943 3c rate 'Exchange Board' censor cover to USA. 1943 (FEB.2.) 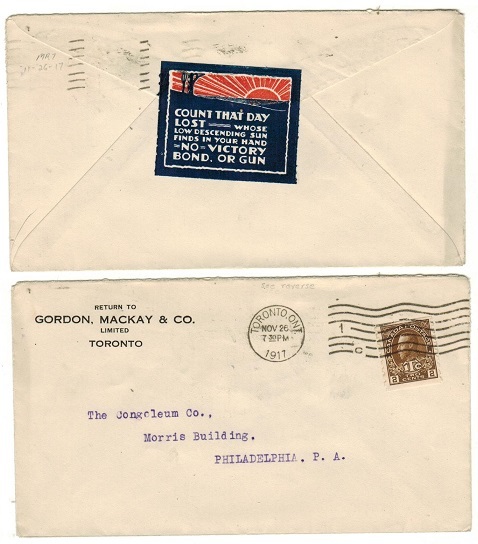 cover addressed to USA bearing 3c adhesive tied by 'V…' strike with TORONTO cds alongside and with (I.B.) OPENED TO VERIFY CONTENTS IN ACCORDANCE WITH REQUIREMENTS OF FOREIGN CONTRAL BOARD AND OFFICIALLY SEALED BY label at right tied on front by magenta PASSED FOR EXPORT h/s. Little type E3-Examiner. 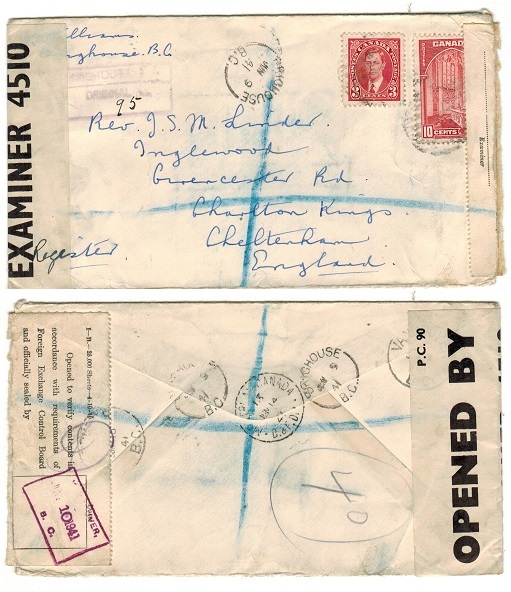 CANADA - 1941 registered 'Exchange Board' censor cover to UK. 1941 (JUN.9.) registered cover addressed to UK bearing 3c and 10c adhesives tied by barred duplex with BRIGHOUSE/BC cds alongside and with (I.B.) OPENED TO VERIFY CONTENTS IN ACCORDANCE WITH REQUIREMENTS OF FOREIGN EXCHANGE CONTROL BOARD AND OFFICIALLY SEALED label on reverse cancelled VANCOUVER. Little type E3-Examiner. CANADA - 1931 use of 2c green PSE sent on first flight from Fort McMurray to Athabasca. 1931 (FE.23.) 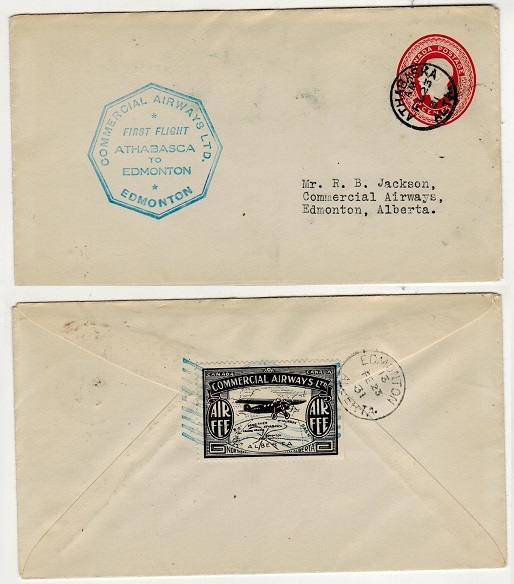 first flight cover use of 2c green postal stationery envelope addressed to Edmonton cancelled by FORT McMURRAY cds and with blue FIRST FLIGHT/FORT McMURRAY TO/ATHABASCA cachet at left and with black COMMERCIAL AIRWAYS LIMITED label on reverse side tied by blue rubber USE AIR MAIL h/s. 873 covers were flown. CANADA - 1931 use of 2c orange PSE sent on first flight from Athabasca to Edmonton. 1931 (FE.23.) 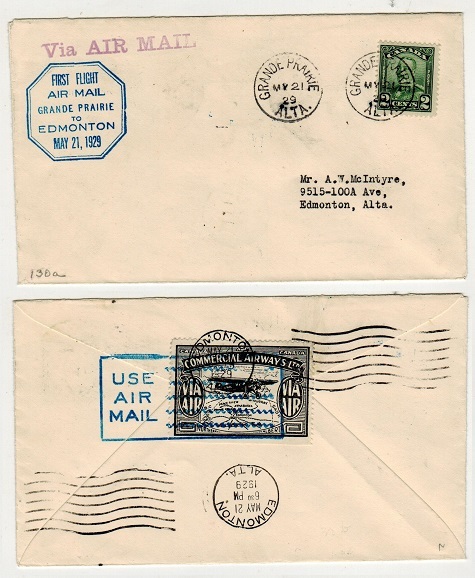 first flight use of 2c orange postal stationery envelope addressed to Edmonton cancelled ATHABASCA and with blue octagonal FIRST FLIGHT/ATHABASCA/TO/EDMONTON cachet at left and with black COMMERCIAL AIRWAYS label on reverse flap tied by blue USE AIR MAIL rubber h/s. 969 covers were flown. CANADA - 1930 first flight cover from Edmonton to Peace River. 1930 (DE.6.) 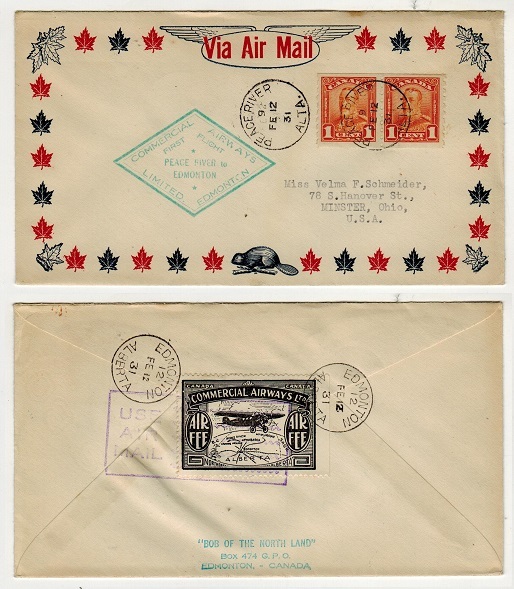 first flight cover addressed to Alberta bearing 5c 'air' adhesive tied by EDMONTON cds with violet octagonal FIRST FLIGHT/EDMONTON/TO/PEACE RIVER cachet at left and with black COMMERCIAL AIRWAYS LTD label on reverse flap tied by violet USE AIR MAIL rubber boxed h/s. 724 covers were flown by pilot W.R.May. 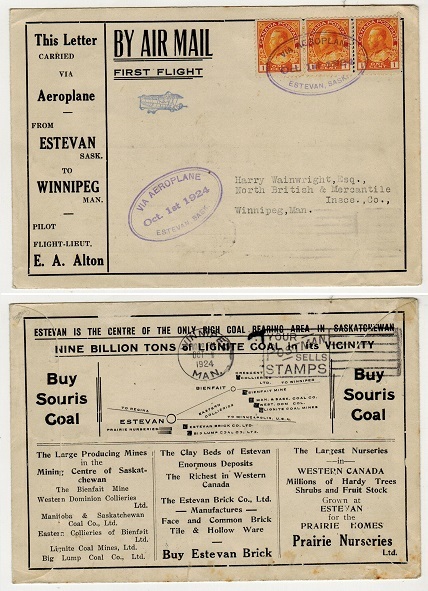 CANADA - 1924 first flight cover to Winnipeg used from ESTEVAN. 1924 (OCT.1) special illustrated pre-printed cover sent on the ESTEVAN/WINNIPEG first flight bearing 1c yellow strip of three tied by superb violet oval VIA AEROPLANE/ESTEVAN,SASK d/r h/s dated Oct.1st.1924. 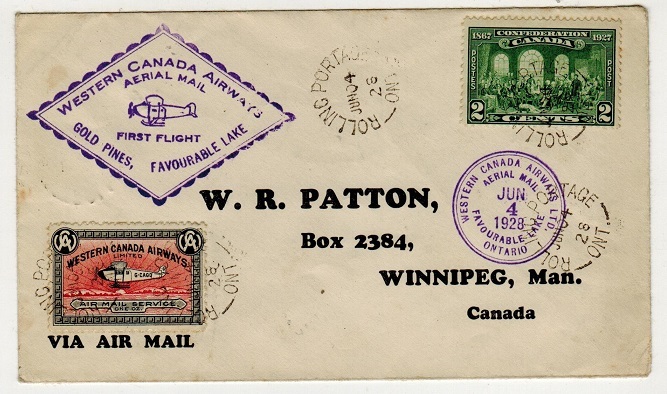 CANADA - 1927 first flight cover to The Pas used from WINNIPEG. 1927 (DEC.6.) 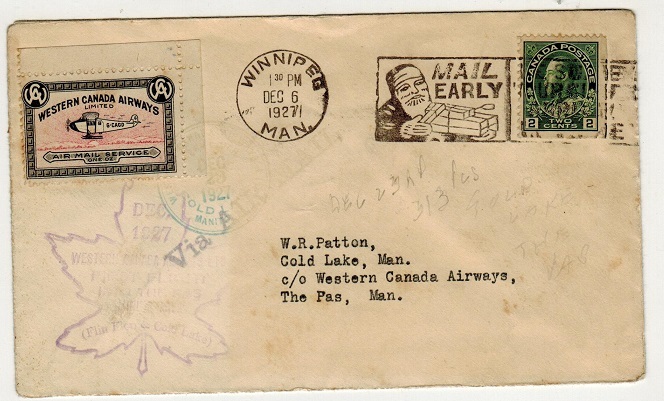 first flight cover addressed to Gold Lake bearing 2c adhesive tied by WINNIPEG/MAIL EARLY roller strike with WESTERN CANADIAN AIRWAYS LIMITED label at left tied by violet 'maple leaf' INTO THE PAS/MINING AREA commemoration h/s and green circular COLD LAKE strike dated DEC.23.1927. VIA AIR MAIL h/s applied and THE PAS arrival b/s. Only 31 flown. CANADA - 1928 first flight cover to Winnipeg used from ROLLING PORTAGE. 1928 (JUN.04.) first flight cover addressed to Winnipeg bearing 2c adhesive tied by ROLLING PORTAGE cds with WESTERN CANADA AIRWAYS label at left similarly cancelled. Violet 'diamond' GOLD PINES FAVOURABLE LINK commemoration cachet at left and violet circular JUN.4.1928 cachet. GOLD PINES b/s. 259 flown. CANADA - 1929 first flight cover to Alberta used from EDMONTON. 1929 (MAY.20.) first flight cover addressed to Alberta bearing 2c 'Confederation' adhesive tied by EDMONTON - CORRECT ADDRESS slogan strike with blue octagonal FIRST FLIGHT/AIR MAIL/EDMONTON/TO/GRANDE PRAIRIE cachet at left and with black COMMERCIAL AIRWAYS LIMITED label on reverse tied by USE AIR MAIL rubber h/s. 700 covers were flown. CANADA - 1929 first flight cover to Wrigley used from FORT GOOD HOPE. 1929 (JUL.1.) first flight cover addressed to Wrigley bearing 2c adhesive tied by duplex cancel with FORT GOOD HOPE cds alongside. Magenta 'Via Air Mail' h/s applied with large blue octagonal WESTERN CANADA AIRWAYS LIMITED/AIR MAIL/FIRST FLIGHT/FT McMURRAY to AKLAVIK/JUNE 29th 1929 strike. Western Canada Airways label on reverse with manuscript signature and WRIGLEY arrival cds. CANADA - 1929 first flight cover to Edmonton from GRANDE PRAIRIE. 1929 (MY.21.) 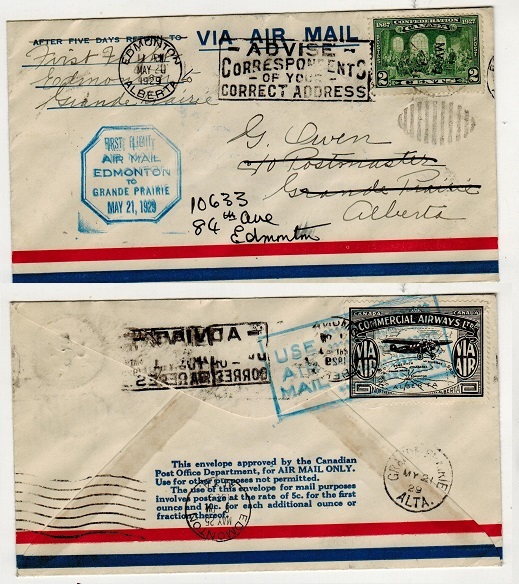 first flight cover addressed to Edmonton bearing 2c adhesives tied by GRANDE PRAIRIE/ALTA cds with blue octagonal FIRST FLIGHT/AIRMAIL/GRANDE PRAIRIE/TO EDMONTON cachet at left and with black COMMERCIAL AIRWAYS LIMITED label on revers flap tied by roller EDMONTON strike. 700 covers were flown. CANADA - 1945 cover to UK with 'RAF FORM No.1674' attached. 1945 (AP.13.) 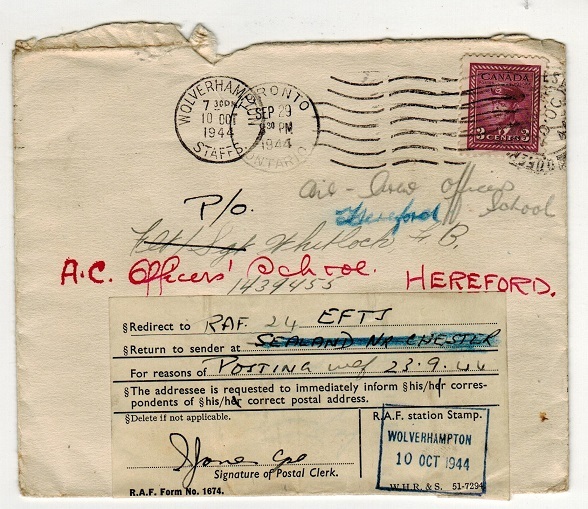 cover addressed to UK bearing 3c adhesive tied by RENOWN/SASK cds with 'RAF Form No.1674' attached at bottom edge for re-directional purposes. CANADA - 1944 cover to UK with 'RAF FORM No.1674' attached. 1944 (SEP.29.) cover addressed to UK bearing 3c adhesive tied by TORONTO roller strike with 'RAF Form No.1674' attached at bottom edge for re-directional purposes.